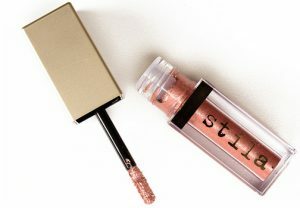 Makeup tendencies on the runway clearly show that glitter is a must-have for the trendy makeup, so we recommend paying attention at these Stila eye shadows. 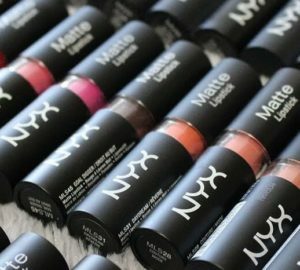 Each package contains 0.15 oz of liquid eye shadow. We have tested 8 most popular colors for you and came up with the comprehensive review on each of them. 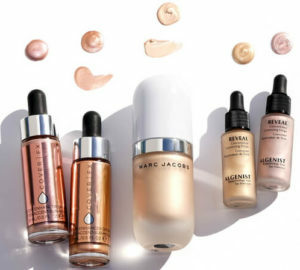 So if you are still doubting, whether you want these liquid eye shadows for your beauty bag, you are welcome to consider our review and swatches we’ve made. 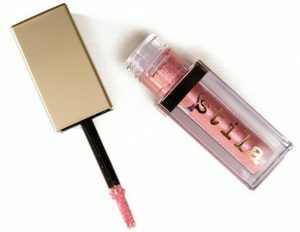 We wouldn’t say that this product by Stila is just liquid eyeshadow, as it rather a multi-purpose product for different makeups. The majority of colors do not feature the color as such, as the base is transparent, with colored glitter in it. 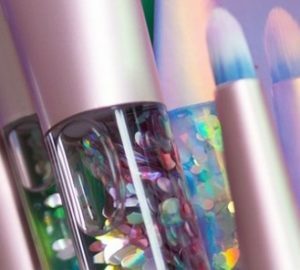 So if you decide to purchase this eye shadow for yourself, we bet you will be using it more as a topper, not just like a stand-alone product. 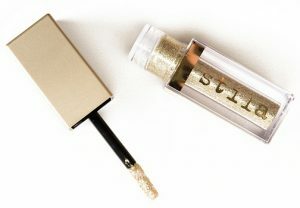 Also, due to the liquid formula, it takes some time to apply these Magnificent Metals Stila eye shadows. 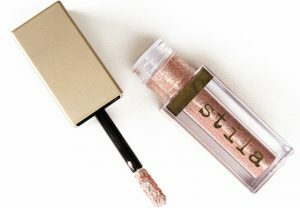 You will need to apply these Stila eye shadows over the eye lid first, and then keep the eye closed for some time to let the makeup dry. Otherwise, it may get into the eye wrinkles and appear uneven when dries. We have noticed, that the less you blend the shadows, the less the fallout is. 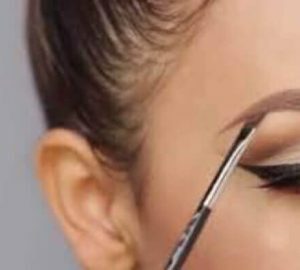 It means that if you apply the eye shadow directly on the eye lid and do minimal blending on the edges, you will gain the most lasting effect with minimal fallout. 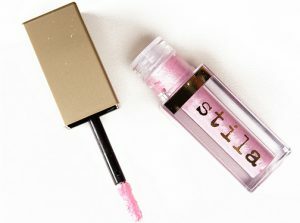 Also we do not recommend rubbing the eyes with the Stila shadow on them, even on accident. Otherwise, you will likely see an avalanche of glitter falling off the eye lid. 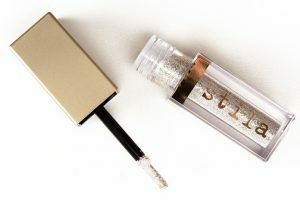 It’s fair to say, that these Stila glitters would be the best final step in your eye makeup. Now, let us check out the colors we’ve tested. 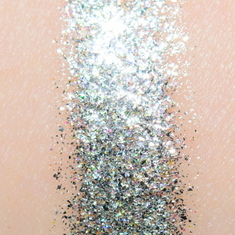 This is a truly bright liquid shadow with lots of gold and silver glitter in it. It does not really feature any color, so in the package you will find a lot of glitter mixed up with watery transparent base. 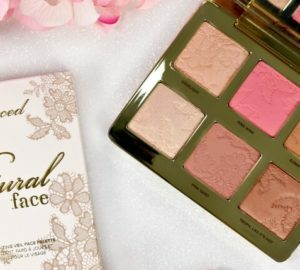 This eye shadow looks better when you use it over something (we tested it over the eyeshadow, over eyeliner and it looked way better when applied over the other textures). 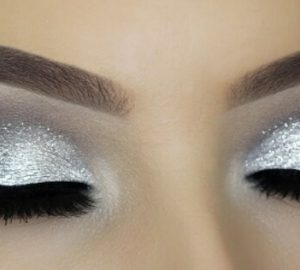 If you apply this glitter eye shadow over beige base or just on bare skin, it may look somewhat uneven. After the base dries, it lasts for 8+ hours with very little fallout. 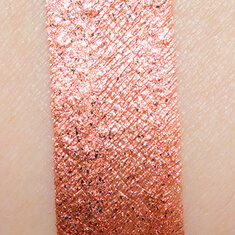 This eye shadow features rosy base and silver and copper glitter. This eye shadow features denser and less opaque coverage, than the other eye shadows from the lineup. 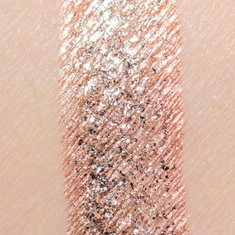 The coverage is still semi-opaque, and the formula features a lot of glitter. 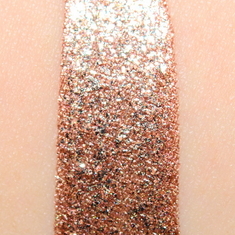 Kitten Karma eye shadow applies pretty even both on naked skin and over the other products. 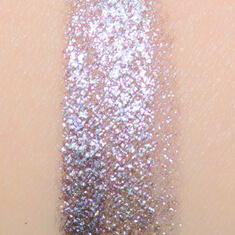 The base does not feature that watery consistency, and dries faster than the other eye shadows in the lineup. It wears for 8+ hours without creasing and with very minimal fallout. This eye shadow is made of medium-gold glitter with warm yellowish undertone. 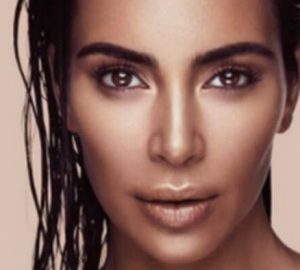 The base is clear, and when the shadow is applied, it is semi-opaque on the skin. 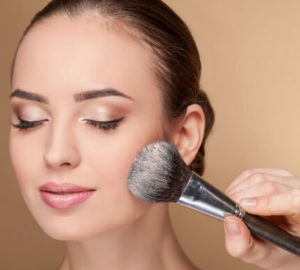 The coverage you get depends a lot on the applicator you use to apply the eye shadow. 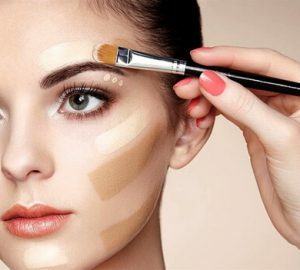 It will take some time for the shadow to dry, so you will either have to hold on for some time with the eyes closed to allow the shadow dry properly, or you risk gaining that creasing coverage. Gold Goddess eye shadow takes 30-60 seconds to dry. Once it dries, it looks sparkling and wears for 8 hours with minimal fallout. 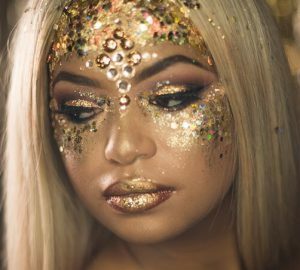 It is a good idea to use this liquid eye shadow as gold eyeliner. This eye shadow is coppery bronze base and silver-bronze glitter. This eye shadow features rich pigmentation and the formula is very thick. 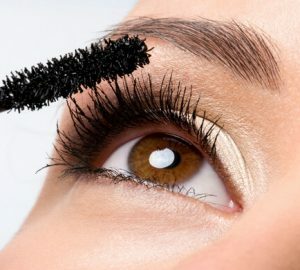 It takes some time to dry without creasing, so if you won’t allow it dry completely before opening the eye, you risk gathering some eye shadow in the lines. The best way to apply Bronzed Bell liquid eye shadow is making a single strobe, letting it partially dry, and then blending the edges with clean synthetic brush. It wears on the eye lids for 8+ hours with very little fallout. 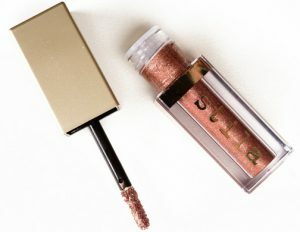 This eye shadow is medium-dark copper glitter with warm undertone and reddish glittery metallic glitter. This eye shadow is extremely rich pigmented, and features opaque coverage with finely milled glitter. 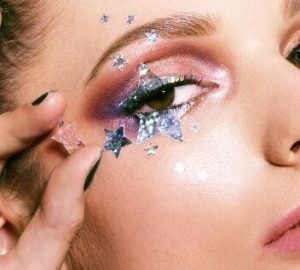 This eye shadow is not as glittery as the other eye shadows in the lineup, yet the formula is the perfect balance of base and glitter. It may be easily used as a stand-alone product, not just as a topper. The shadow lasts for 8+ hours without fallout. 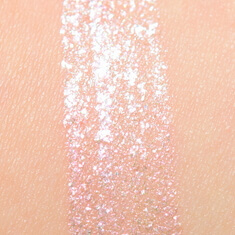 This is pink eye shadow with warm base undertones and cool pinky silver glitter. 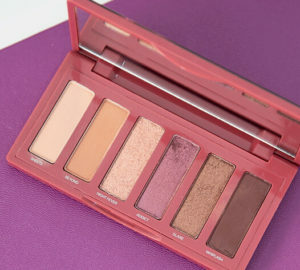 The eye shadow features semi-opaque coverage and may be used as a stand-alone product, as well as eye shadow or lip topper. Also, the Ballet Baby eyeshadow can be used as eye liner or as an accent for the inner corner. Once applied, the formula lasts for 8+ hours with no fallout. 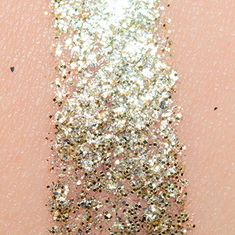 If you decide to use the Ballet Baby glitter as a stand-alone product, you will have to put some effort to blend it for smooth and consistent coverage. 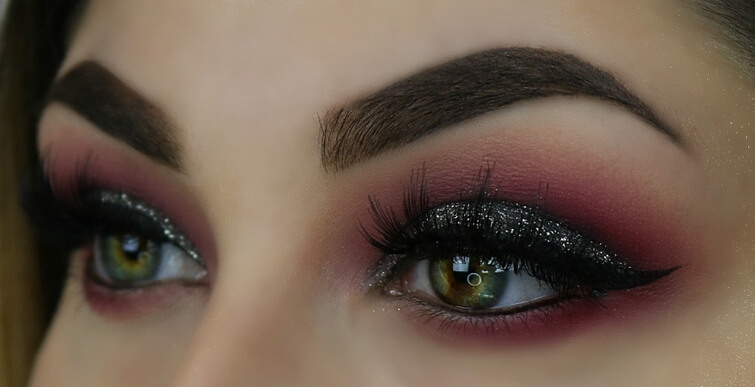 This eye shadow features warm pink base and sparkling reddish glitter. It wears for 8+ hours over the other eyeshadow with very little fallout. 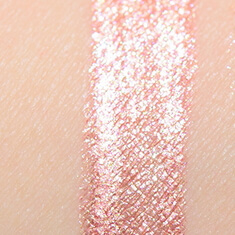 Glitter is somewhat pearl and the formula is very lightweight. 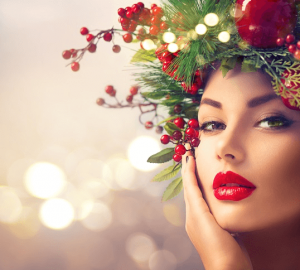 As an option, you may want to use it as a topper over lipstick to add an extra accent to the lips. It dries down smoothly within 15-30 seconds. 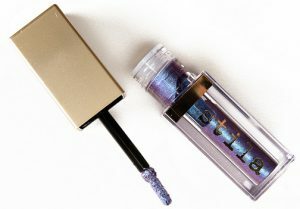 This is a neutral purple eye shadow that features glitter finish with cool undertone. It may be quite challenging to apply the finish evenly, as the formula is somewhat inconsistent when used as a stand-alone product. 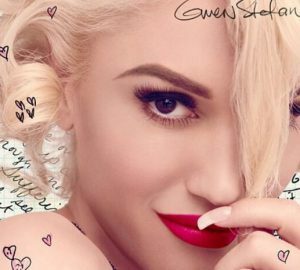 We found it a perfect product for application as eyeliner, or on top of black eyeliner. It wears for 8+ hours with minimal fallout. 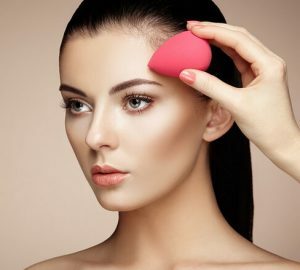 When the products dries, it will be difficult to blend it. I recently bought this liquid eye shadow in Diamond Dust color, and I absolutely love to apply it in the middle of my eye lid over the other eye shadow. It seems to dry somewhat long, yet I love the way they wear!